Getting Medieval on You | House Unseen. Life Unscripted. A custom coat of arms designed especially for us and our craziness. You've met her here before and she'll be back again for Webby Wednesday for her brand spakin' new 2nd store (which I will not reveal to you today, because I am crafty and spy like), but I just couldn't resist sharing this with you RIGHT NOW. Visit Melissa on Etsy (her original store, of course). She's so clever! Isn't it great??? I totally think she should get into the blog/button design biz! Talent, I swear. I love! The crooked house, the chick, the guitar, everything!! that is so dang cute! I WANT ONE. One that says MY name. 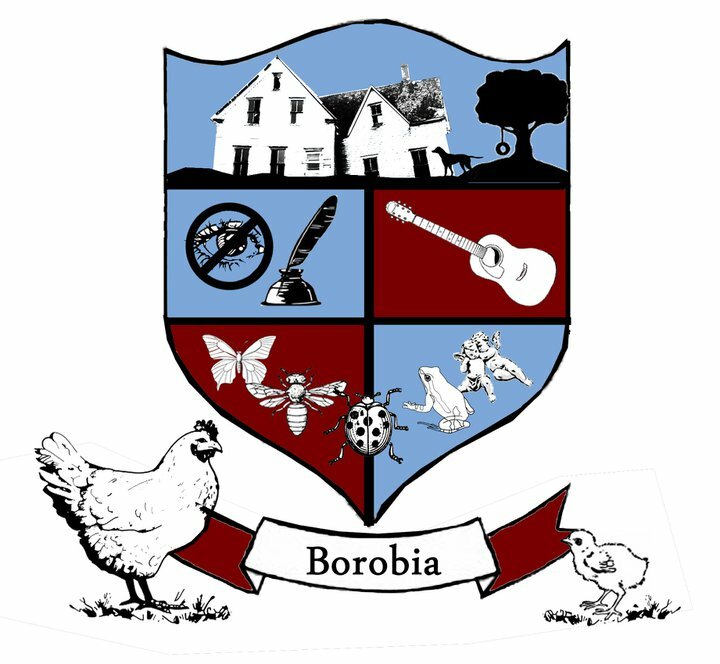 Not Borobia. That would be weird. Hi friend!! :) This. Is. Awesome!!! Everything I could have envisioned for your blog and family and then more. Too cute. You should totally try to use this as a new header. It would be so unique. Anyways, have to catch up on your recent adventures. Hope you had a great weekend! THAT is AWESOME!! It's perfect for you guys! thought of the guitars when I saw this page. By the way - great coat of arms! I want one!